These were delicious. They were light and moist with a nice cinnamon flavor. I’m generally not a fan of snickerdoodle cookies, they are usually too bland for me. These cupcakes are far superior to their cookie cousins. I do prefer most things in cupcake form. The frosting is a seven minute frosting. It is similar to a marshmallow but with a fluffier texture, contains no gelatin and is very pipe-able. It does need to be eaten within about a day or it starts to soften and lose structure. I’ve made this with a hand mixer, but it is much, much easier with a stand mixer so that the eggs can be whipped hands-free and the boiling hot and dangerous syrup can be controlled with two hands. I had some leftover frosting and thought I would add it to hot chocolate, since it reminded me of marshmallows. I think this was the worst idea I had in a long time. It was disgusting in hot chocolate. It didn’t melt, but the sugar dissolved and then the remaining egg parts cooked into little egg bits. Yuck! Don’t ever try it. In hindsight, it is obvious that it was a bad idea. I’m always careful when I temper eggs in custards so they don’t cook, why would I think to do this? Combine 1 1/2 cups sugar with the water and corn syrup in a small saucepan; clip a candy thermometer to side of pan. Bring to a boil over medium heat, stirring occasionally, until sugar dissolves. Continue boiling, without stirring, until syrup reaches 230 degrees. 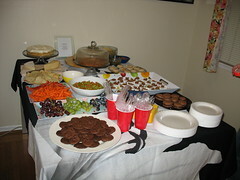 My dessert party this year was another great success. I had some delicious desserts and great friends to share them with. More details on all the recipes will be coming soon, including the results of the voting for the best dessert. Author planet1Posted on March 10, 2008 Categories Dessert PartyTags Dessert PartyLeave a comment on The Dessert Party was Successful!